This is an important moment in your life. You want to take your very first yoga class ever. Maybe you’ve been stressed, you finally want to do something about that achy back or you simply want to understand what all the fuss is about with yoga. In any case, this is your moment to learn all the ins and outs so you can step on that yoga mat with confidence. Yoga is yoga, right? Uh, nope. There are many different styles and forms of yoga, so it makes sense to check what this type of yoga is especially about and if it fits your expectations. Also, every yoga teacher is different so try to find out as much as possible beforehand – you will often find little descriptions of the teachers on a studio’s website. This will hopefully give you an idea about the specific teacher, but eventually you will have to take the class to really get to know their teaching style. Some are more spiritual than others. Some will play music during the class, others won’t. Most importantly, the teacher and class should fit to you and what you need to feel good. Whatever you do, choose a beginner’s class. Having a big meal before you go and stand on your head – not a good idea. That’s for sure. It’s a bit of a golden rule to not have any food until about 2 hours before your practice. Has it been a long day and you need a little snack? Choose something light, like a smoothie or soup as a little pick-me-up. Make sure to wear comfortable yoga wear. This is important as yoga wear is designed and made especially for your yoga practice. Your yoga outfit should feel comfortable, soft, it should breathe and not be too tight. If you need more background info about what yoga clothes to choose for your yoga practice, click here. Either way, it’s a good idea to wear layers as you can’t predict how warm or cold it will be at the studio and how your body will react to the class. So, wearing layers will give you the option to adjust as needed. Our model is wearing our yoga active wear sports bra Ananda Ojas in Rock Crystal with matching Satya active high waist yoga leggings. We know you might feel a bit awkward stepping into this new yoga world, but it’s definitely a good idea to introduce yourself to the teacher and let them know that you’re new. If you have any injuries or physical restrictions, you can share that quietly, without the entire class eavesdropping. Plus, depending on the yoga studio, you might be one of 40 students, and while yoga teachers will try their best to remember their yogis, it will certainly be quite the challenge. If you quickly show your face before class, chances are that they will be able to keep an eye on you and help you out. Otherwise, you might be just a face in the crowd because it is not always easy for the teacher to to know if it’s your first, 10th or 100th lesson. Many yoga classes begin and/or end with chanting OM, depending on the yoga teacher. OM is a series of sounds, a mantra, that carries primal energy according to yoga traditions. You can learn more about the meaning here. Apart from the meaning and energy of OM, it’s also a nice way to have everybody focus on one thing and to arrive on the yoga mat. Try it out, you don’t need a pretty singing voice. Because that’s not what it’s about. If you don’t feel comfortable, you don’t have to participate. You can simply listen. Sun salutations are a series of exercises that you will encounter in many different yoga classes. Especially if you take a vinyasa, hatha flow or ashtanga class, you will do one of the many variations. Sun salutations are often done as a sort of warming-up. You might even break a sweat. In other classes, sun salutations will be the foundation to work towards other yoga poses. Nobody can be “the best” at yoga. That’s important to keep in mind, especially as a beginner. Yoga is about you and your body. You come as you are. Your body has a story, has endured things, stress (physical, emotional and mental) and it’s all engrained in your body. But also other things like the fact that you work an office job and spend 8 hours each day behind a computer – you will certainly feel that in your shoulders, neck and back. You will feel it all, and that’s what you’re working with. Your neighbour on the next mat is working on her own story and her own body. That is not of your concern. You don’t know her story, you don’t know what her body can or can not do, or what feels good or not. So if it looks like she must be “fantastic” at yoga because she does the poses as “good” as the teacher, or without a drop of sweat, it is her story. Focus on yourself and just be open to yourself, your body and your experience. You will get there. And don’t forget, everybody was once a beginner. Pain and going to far = not okay! Beginners and even advanced yogis may think that you have to push your body to get into a certain pose. That a little pain is just part of it all. But, that’s not the case! Treat your body with respect. A little challenge is good, but as soon as you feel pain anywhere in your body, you need to stop. You might want to raise your hand to let the teacher know that something is not going right. They can usually give you tips on how to adjust the pose to better fit to your body. You don’t want to get their help? That’s okay, too. Simply go into child’s pose and take a break. 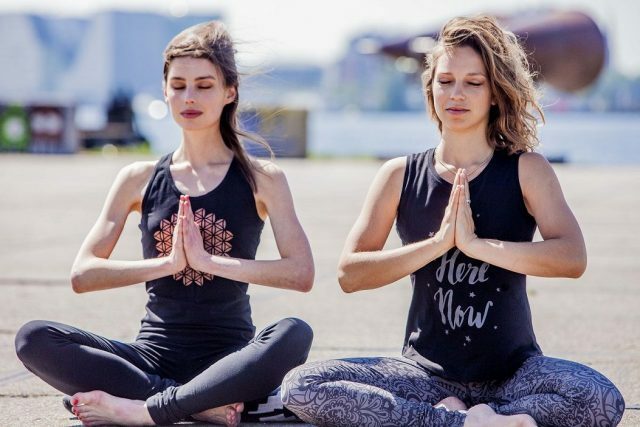 Our model on the left is wearing our Mandala yoga top in Urban Black and our Bhaktified yoga leggings also in Urban Black. Our model on the right is wearing our Be Here Now yoga tank top in Urban Black and Bhaktified Anjali in Volcanic Glass. After the physical exercises are done, you will often find meditation and relaxation practices to finish your yoga class. There are many different ways to do this. Some yoga teachers use guided meditations to lead you through the entire process, others will give only little guidance, followed by a period of silence or calming music. For many yogis, this is the best part of a yoga class. Others might find it difficult to relax fully. Try to go into it with an open mind. If you manage to let go and relax, your body will get more out of this practice than out of a few hours of sleep. And yes, this is scientifically proven. Leave your phone on silent mode in the changing room, or – if you really can’t miss it for an hour – turn it off. If you want to bring some water – might come in handy during class! – then bring a cup or bottle with a lid that you can close properly. You wouldn’t want to make a mess if your cup gets knocked over by accident. Drinking glasses are a big no-go during yoga class. You practice yoga with bare feet. If you suffer from some sort of fungus or other infectious skin disorders, you might want to wear special yoga socks to avoid spreading it on the mat. Respect the silence in the room. Many yogis like to relax before the class begins, so if you want or need to talk, please do so quietly. Personal hygiene is important. Nobody wants to smell another yogi in a shirt that actually belongs in the laundry basket. Make sure to wear clean yoga wear to class, and if you know that your body will easily break a sweat, choose a good deodorant. Give other yogis enough room for their practice. There should be enough space between the yoga mats so that everyone can participate in the class comfortably. Nature calls and you need to go to the toilet during class? No problem of course, but try to leave the room as quietly as possible. A yoga class is not the time and place for talking, so if you want to say something, please do so with a soft voice. Save those longer conversations for after class. Make sure to clean your mat after the class. Most yoga studios will have special mat cleaning supplies to keep the mats nice and fresh. This entry was posted in General, Yoga Practice and tagged 10 tips for your first yoga class, first yoga class, what you need to know before your fist yoga class, yoga nettiquette, yoga newbie, yoga survival guide.